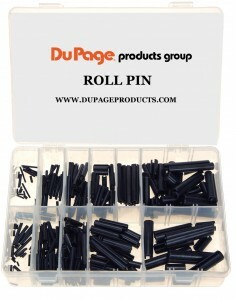 Made of flexible spring steel with chamfered ends to simplify insertion. Handy kit for shop toolroom or toolbox. On hand when needed saves time and money. Plastic compartment box is easy to store. 10 each of 1/16" diameter by 3/16", 5/16", & 3/4"
10 each of 5/64" diameter by 1/4", 1/2", & 1"
10 each of 3/32" diameter by 5/8", 1-1/4", & 1-3/4"
15 each of 1/8" diameter by 5/8", 1", & 1-1/4"
10 each of 5/32" diameter by 5/8", 1", & 1-1/2"
15 each of 3/16" diameter by 5/8", 1", & 1-1/4"
10 each of 7/32" diameter by 5/8", 1-1/4", & 1-3/4"
10 each of 1/4" diameter by 5/8", 1-1/4" and 1-3/4"
10 each of 5/16" diameter by 3/4", 1-1/2", & 2"
5 each of 3/8" diameter by 3/4", 1-1/2", & 2"